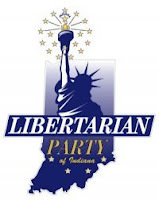 It was just a year ago yesterday that at-large Republican Indianapolis City-County Councilor Ed Coleman announced he was leaving the Republican Party to join the Libertarians. I attended the poorly-attended press conference that day. Although capturing a Republican seat on the council of the 13th largest city in the United States was a major victory for the Libertarians, the media didn't seem to notice. That turned out to be the low point of Coleman's first year as a Libertarian. Well, actually the low point might have been the Republican's foolish decision a few days later to strip him of committee assignments and alienate him from his former party. At the time, I chided the Republican leadership for an inability to do basic Math. Only one more Republican had to defect and the Democrats and the disaffected Republicans could control the council. Republicans needed every vote they could get on issue and turning their back on Coleman was stupid political strategy. While the Coleman announcement fell flat, the following months into Coleman's tenure offered opportunities for the Marion County Libertarian Party to make news as the loyal opposition to big government, a position that the Republicans had abdicated in favor of supporting Mayor Greg Ballard who, post-election, fell in love with corporate welfare and tax increases. Libertarians like Marion County Chairman Timothy Maguire skillfully used the media to make the case for less government. The media which is always looking for conflict, took the Libertarians up on their efforts to fill in for the MIA Council Republicans who were too busy defending the Mayor's big government ideas to notice that the Libertarians were stealing their philosophical souls. Libertarians pointed out the unenforceability of the pan handling ordinance and how, as written, it could be used to go after political speech. Republicans ignored the problems with the ordinance and lock-step voted for it. Then you had the Libertarian Party's opposition to the comprehensive smoking ban proposal, which nanny-state measure was unbelievably introduced by a Republican, Councilor Ben Hunter. If there was ever an issue that cried out for conservative, pro-liberty political opposition it was a proposal that government tell private business owners they can't allow smoking in their places of business. While many Republicans opposed the ban, especially when extended to places like bars which are only patronized by adults, few were willing to speak out against it. Then you had the most recent flareup on the Council. Libertarian Coleman introduced a measure to allowing guns to be taken into city parks, just as guns are allowed into state and national parks. Mayor Ballard blew a gasket and immediately threatened a veto. With one stroke, Coleman had successfully made known to Indianapolis what those of us who have dealt with the Mayor's Office on gun issues have known for some time - Mayor Ballard treats the Second Amendment like he does a door mat. He wipes his feet on it. Again, while many Republican councilors behind the scenes laud Coleman for being right on the gun issue and quietly express support, few are willing to make the case forcefully that the Mayor is wrong and Coleman is right. Once more,Republicans cede the conservative philosophical turf to the Libertarians. In addition to the aforementioned issues that have played themselves out on the front page of the newspaper and on the evening news, Coleman has also introduced successful measures putting city contracts on-line and providing spaces for motorcycle parking downtown. It's been a good year for Coleman and the Libertarians. Can Maguire and Coleman turn this new-found media attention on the Libertarian Party into votes? That will be an extraordinarily steep mountain to climb. Election results indicate that voters still see politics through a two party lens. They don't punish Republicans who betray their philosophical roots by electing Libertarians. Voters punish Republicans by electing Democrats, even if many times that is a result of angry Republican voters casting a ballot for Libertarian candidates as a protest vote and thus giving the Democrat candidate a plurality of the vote. When I think of how much time and money I personally spent in 2007 to help turn that city council Republican, and consequently how little to nothing I received from the Republicans for my help, I cannot help but be hurt by their betrayal of their promises. The best thing that happened to Indy city council was Coleman's defection from the filthy Marion County GOP led by Tom John. I hope in the future more councilors will have the political courage to defect from their unprincipled parties because neither the Republicans or Democrats are true to their principles. I'm very grateful to Ed Coleman for standing up for us and embarking on that principled road less traveled. Well, congrats to the Libertarians on their first year. 2011 will be interesting, indeed, to see if one or more can be elected from the "L" portion of the ballot. With Smith off the Council and Plowman under a cloud, the Republican caucus simply doesn't have any wiggle room to push forward any agenda. If my count is right, its 14 Rs, 13 Ds, and 1 L, at the moment; no majority. When is Smith's replacement to be decided upon? I'm gagging. Puh-leeez! Stop the canonization of Ed Coleman. Christine, rather leave a moronic response as you did, why not offer the readers here something good done for us by the Republicans or Democrats on council in the past year? My guess is because you cannot. I'm open, but I cannot think of a meaningful thing that the Republicans on city council did for us this year. And no one is canonizing Coleman, however, he didn't betray his principles. I cannot say that about the others with the exception of Councilor Scales. Christine/anonymous, maybe you can enlighten us to who are the principled council members?